I have been feeling pretty uninspired recently . Wait…no, not really uninspired, maybe a better word would be unMOTIVATED! Cause I am plenty inspired – all it takes is opening my blog reader and reading a few blog posts or logging on Pinterest and opening a few hundred tabs of things I love. (By the way, need some inspiration – follow me on Pinterest here so you can see what I am pinning. So, no, the problem is not lack of inspiration. It is totally a motivation issue, I think. Anyone relate??? So I thought I would share some things that are inspiring me lately. And in sharing them publicly with all my readers and the rest of the internet world, maybe motivate me to start actually DOING THEM! I have so many rooms and projects that I want and need to be working on. Like my kitchen – I was hoping to have painted my cabinets already. Now I am hoping I can do that this fall before holiday craziness sets in. I am LOVING all these bright white and cheerful kitchens. And I am also noticing that they usually are very neutral, but with pops of color! This kitchen is from Design OCD written by Jae who I actually met last Saturday on my blogging lunch! I am having fun going back through her blog. Her kitchen was also recently photographed for a Better Homes and Garden’s magazine feature! I also love the “YUM” – different then the normal “EAT” that you see. But I do love the “EAT” letters too. In fact if you follow me on Instagram (ChristinaFrugalHomemaker) you know I was at Hobby Lobby recently trying to decide which style of letters to pick out. Yep, they are in the corner in the living room still in the bag waiting on some inspiration motivation to do something with them. Can someone just cut and paste this kitchen from BHG into my house? Gorgeous! Again I am noticing word art, pops of color among a base of white, cream and wood neutrals, some vintage finds scattered on the counters like the old metal locker basket and the teal vintage scale on the windowsill. And chalkboards! Do you know that I do not have a single chalkboard in my house yet?? I have pinned who knows how many pictures of cute DIY versions of chalkboards on Pinterest and yet, I still don’t have one in my house. My friend Laine just shared how she made this giant hanging chalkboard in her dining room/school room for $8.00. In fact you can turn any old frame or even mirror into a chalkboard by just painting over the glass with chalkboard paint. I need to rummage through my frame stash and see if I have one that will work. Then I have a set of thrift store lamps that I have painted that I need to show you. But that requires motivation to clean off the furniture that they are one, stage it, and then take pictures. Maybe I will find that motivation this week But I haven’t decided what I am going to do with the shades. Cover them with a fun fabric or paint treatment in a chevron pattern? Or maybe cover them in burlap and add some pretty trim or flowers? And then we move upstairs to the bedrooms. The master bedroom… I lay in bed at night and dream of the day when my furniture is refinished, the room is decorated, and I finally have a beautiful master bedroom. Yep, dreaming about it is about as far as I get. Yes, my $40 dresser, nightstand, and chest of drawers yard sale furniture is still sitting in the garage awaiting a cooler day that will allow me to get to work painting or staining it. But I am trying to figure out what to do for the bed. I am really leaning towards doing a DIY upholstered headboard but a little overwhelmed. Do I use the frame with our current bed or look for another one, what shape should the headboard be, and what color fabric should I do? And what color should I paint the room? Way too many decisions so I just stop thinking about it all. Here’s a DIY version done by Jenna Sue that I pinned for inspiration. And I am dying to make some small changes to our living room – really just 3 main things and some pilows. One of which is inspired by this picture. She painted this curtains – yes painted them! Totally inspired – anyone want to come paint them for me since I lack the motivation? Plus I really need to install a light fixture in the laundry room, and do a project in there so I can show it to you. AND I just found the piece last week that I have been looking for to start redoing our guest room – will share on Friday in my frugal finds post. Which means another dresser to repaint, a pretty big DIY project to complete, and re-decorating with some of my yard sale finds that are stashed away! And my hubby REALLY wants the garage cleaned out which means painting all the furniture in there and getting it into the house, throwing away a bunch of junk, maybe having another yard sale, and finally getting that space organized and functional. And some little projects that I am inspired but unmotivated to do? This one is pretty much at the top of my list. So much prettier than that Dawn soap container sitting on my sink. The Blissfully Content Life shows you exactly how to make this and it looks like it couldn’t take more than 20 minutes. And then the time of year and weather is making me start having fall fever. I usually am one to hold onto summer as long as possible because summer is just fun to me. Longer days, vacation with my hubby, fun outings, lots of picnics, and outdoor activities. But I am seeing fall (and Christmas stuff too) in stores everywhere, the weather has been in the 80’s this week which has felt wonderful, and I bought a few fall pieces of clothes – a denim jacket and a fun colored fall scarf that I can’t wait to wear. 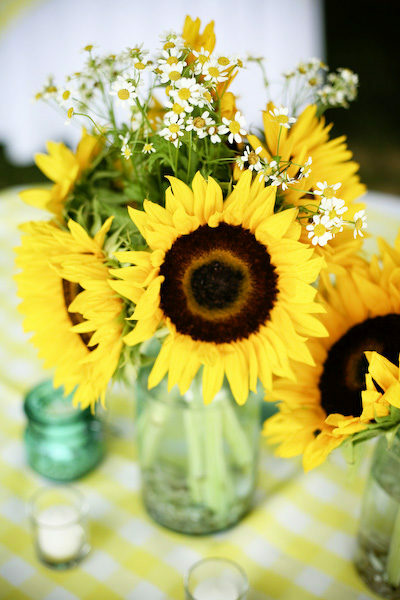 I am loving sunflowers this year more than ever. They seem like the perfect transition from summer to fall. Still summery but yet they hint at the golden colors of fall on the way. So there you go – tons of inspiration but a lack of motivation to create these pretty things. Just being honest today – I think we all face overload or burn out sometimes. And sometimes it helps to stop, regroup, and then move on! Now that I am even more inspired by finding and sharing all these pictures, the motivation will show up. I am excited to have a free Saturday this weekend for the first time in about 8 weeks. Maybe after I make a quick run to the yard sale I can get busy and have some fun projects to show you soon. How about you? Feeling inspired but unmotivated? What is on your want to-do list in your home? Thanks for the shout out. It was so nice to meet you as well. I know what you mean, I go through phases of feeling uninspired/unmotivated. Can’t wait to see your painted cabinets! Oh wow ….. I can so relate to how you are feeling. I have a number of projects floating around in my head, on my Pintrest boards, on a actual to do list for the house, but haven’t had the motivation to accomplish very many of them. I work full-time and have time at work to surf the web (pintrest and blogs to be exact). I get very inspired/motivated at work with all these ideas, but by the time I get home have dinner and clean up. I’m pretty much done for the day. Thanks for sharing. It’s nice to know that I am not alone!! Here’s to accomplishing something this weekend!! Have a good one! I am feeling the opposite right now…tons of motivation and plans. But have to wait on the budget ot free up to get them done. And I HATE waiting when I have plans to be carried out 🙂 We get paid tomorrow and hopefully I can stash away a few bucks to purchase some supplies for my next projects. I love those letters in the kitchen, and have already bought some wooden ones at Michaels that I got on uber-clearance…just need to get the fabric to cover them. Instead of doing a kitchen-themed word like “yum” or “eat” I wanted to go with something that had meaning to me. So, I bought the letters to spell out the world “JOY”. It’s my middle name, but also an attitude I aspire to have in mylife. Plus cooking and being in my kitchen bring me joy! I’m trying to figure out a way to attach the covering that let’s me switch out the fabric according to the season (or my own whims), but am still working out a way to do it. Did you see how my painted curtains came out on Facebook? I LOVE them and they add so much to the kitchen, but they were a lot of work. Be prepared to use more paint than you thought and spend more time than you imagine. People tell me they would rather spend more money instead of the time involved with DIY stuff, but there really is a certain satisfaction with doing it yourself! Your motivation will return…probably along with cooler weather. It’s hard to feel like doing anything outside (painting, rearranging, crafting) when it’s so hot/humid! Personally, I can’t wait to see what you come up with next! First off, love your blog! Love reading something that seems so real and so much like me! I would start small – def do a chalkboard project..it takes little time, little effort, but you will love it. I just spray painted a green picture frame white, then (no primer or nuthin) sprayed the glass with the chalkboard paint and done! I think pinterest/blogs sometimes overwhelmn us with all the stuff that isn’t done. I have a million things to do and seems I keep running out of time. I know you will get back in the swing of things – tackle the little stuff first! Please do not do anything chalkboard in your lovely home! I think that look is so – well, to put it bluntly – STOOPID. thanks for the advice, Jan. I promise if I do something chalkboard it will be upscale and pretty inside a pretty frame. But I am also not sold on even doing a chalkboard yet either. as for the headboard, I really need one in my guest room and want the cottage, chic, vintage look in there so I think it will look good. Our guest room is used a good bit with my nieces that I keep each week (although they won’t really appreciate it). But I would really like to make an upholstered headboard for our room for comfort. the dresser is part of a whole set that I bought at a yard sale and will become my new master bedroom furniture. I plan to reuse the original hardware – maybe just polish or paint them. And I am going to TRY to sand and restain it but there is some damage on the other dresser drawers and I am not sure if I will be able to repair it enough to stain it – then might have to paint it. Big doors or use two doors to create a double door look. If you have a huge wall and dont know how in the world you can use all that space without it looking cluttered or that it just runs on, I have seen where you take doors to mount against the wall and frame them out to break-up the wall and create interest and then add your decor to the walls around the faux doorway. Especially doors from an old old building. Or a fireplace surround. I just put a fireplace mantle and surround in my bedroom on a wall that needed something but another piece of furniture just wasnt working and a chair took up too much room. Just need to decorate it now. P.S. Love the picture of the fireplace mantel with the straw bale, mums and pumkins in it.